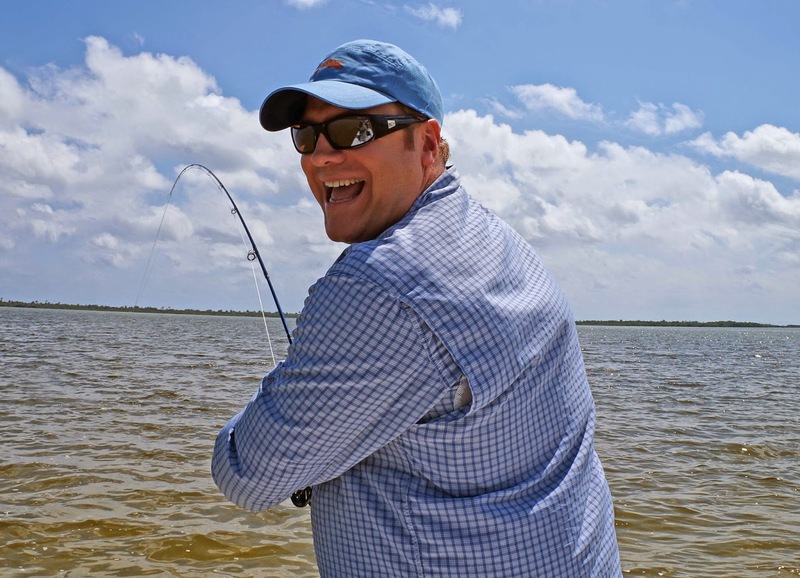 Chifly.com Blog - Chicago Fly Fishing Outfitters: Best trip ever? First of all, it was a much needed escape from the Chicago winter of 2014. The cold, and snow, and grey skies and the collective "funk" that pervaded and afflicted all of Chicago seemed like it would never end. We were knee deep in snow - and it was mid March. This was also the first time since October that I would have a chance to wet a line, and it was a chance to do so in a tropical setting! For the past 6 or 7 years, I had really found happiness and escape at a lodge called Boca Paila. I was not alone. An easy to get to destination a mere 3.5 hour flight from Chicago, but alas, it had closed. 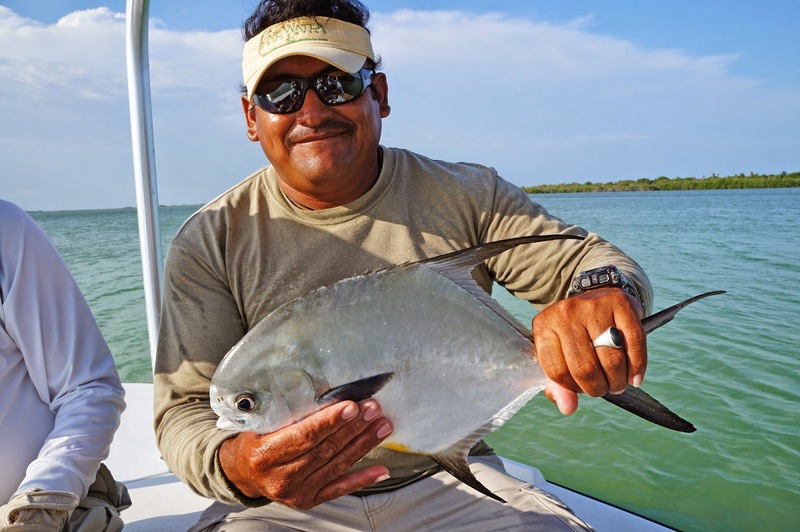 The pioneering lodge that had help developed "flats fishing" in Mexico, and introduced countless anglers to the wonders of bonefish, snook, tarpon and the mythical permit had sold the lodge property to a developer and we were out of luck. Not so - an email that arrived from the lodge owner a few months ago explained. Boca Paila has morphed and is back - sort of. Several of the long term guides were still "on staff" and the permits for guiding rights to the legendary fishery were in tact. If we were interested in staying at a nearby beach house, with house keeping and cooks, they were back in business and we could return to this special place and relive the fun. Done. 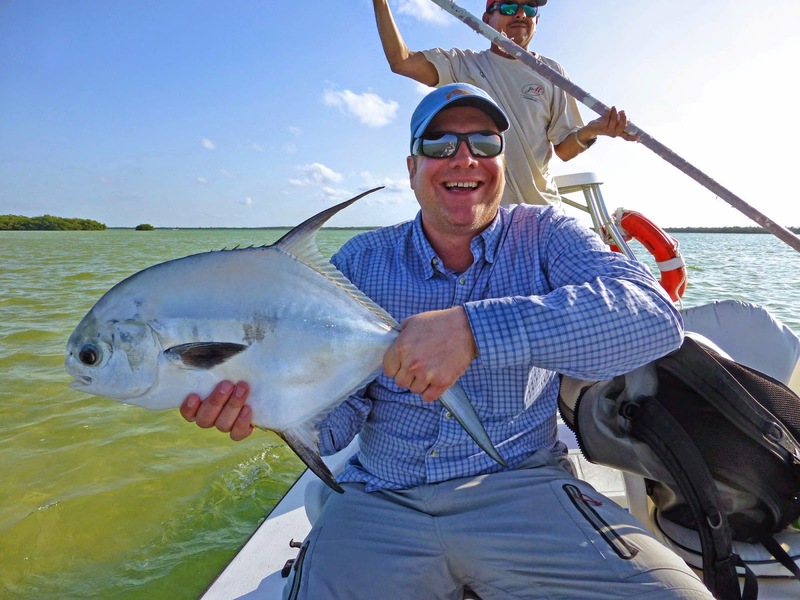 There are many superb options for great lodging and guided fishing in the "Ascension Bay" area of Mexico - but I have developed a friendship with a particular guide named Luciano, a 20 year veteran of this particular fishery and lodge. I decided to return here again and spend one more week seeking the frustrating permit. Luciano is known as "Bimbo" - not because he chases women, but because as a kid he liked the Mexican version of Wonder Bread known as Pan Bimbo. I don't know if he is the "best guide" - that is a relative term and far too objective. Subjectively, I know that I fish better with him than with most other guides. He knows what I am cable of, and what my strengths and more importantly my weaknesses as an angler are. When he says 50 feet, I know what 50 feet means to him. When he says a "cast a little father" that means 5 feet further. When he screams "cast a little farther" that means 10 feet more. He never gives up on a fish and works like a dog. Bottom line is that I really enjoy fishing with him. 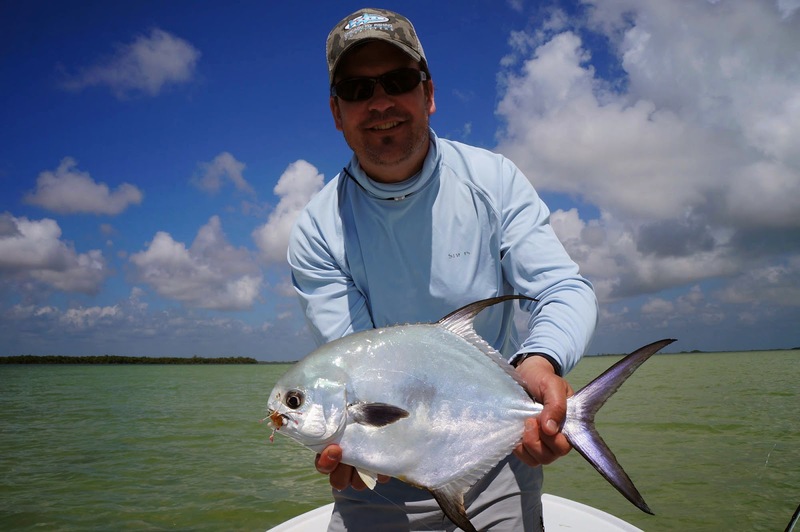 Up until that point, he had guided me to my first permit, and to 5 of the 7 that I had ever caught. On Day 1 we had superb weather, had forgotten the snow, and were beginning to relax. My boat mate and good friend, Steve Hodges, had been with me the last 3 or 4 trips. Steve, as a fisherman, is much more accustomed to swinging flies to BC steelhead. He loves the "hunting" aspect of flats fishing and immediately took to this very different kind of game. 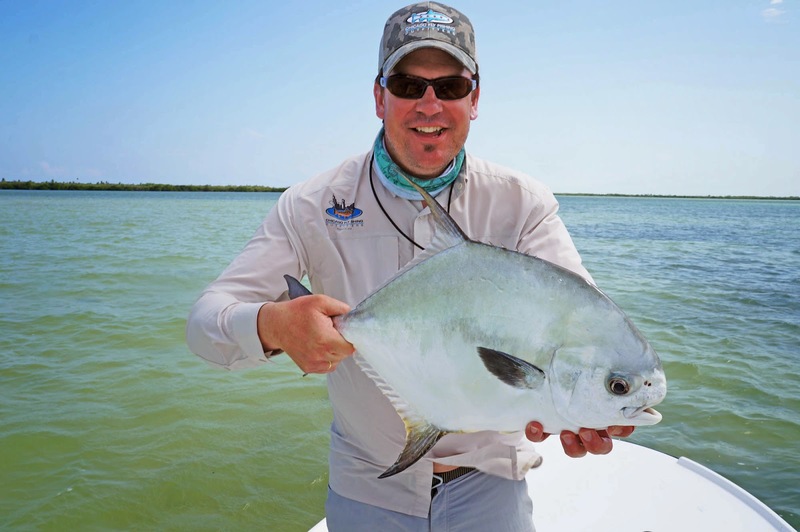 On his first or second turn on the bow, a couple of permit magically appeared 30-35 feet in front of him. Bimbo shouted "cast" - and he and I were already grinning at one another in anticipation of Steve's recap of what surely would soon go wrong with these two particular fish. This is what a look of surprise or disbelief looks like! A bent rod with a permit attached at the other end! 5 minutes later, Steve sat shaking like a wet puppy, holding the very first permit of his budding career. He had to sit down for the photo as his knees were knocking together so hard! I know for a fact that something shorted out in his brain - and that Steve was deeply happy at that moment. The up until now "impossible" happened - and all was right in the world. Congrats!!! I know it did, on the other hand, bring a grin to his face seldom seen! Another round of congratulations. 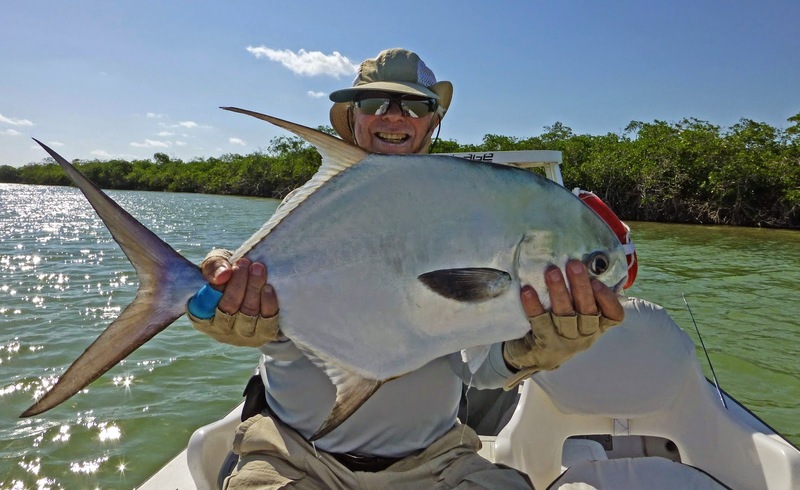 Then Steve repeated with his second permit - and we were only on day 2 of 6! As if this wasn't already too good to be true, I am almost embarrassed to report that I had what can be simply described as unbelievably great luck all week long. 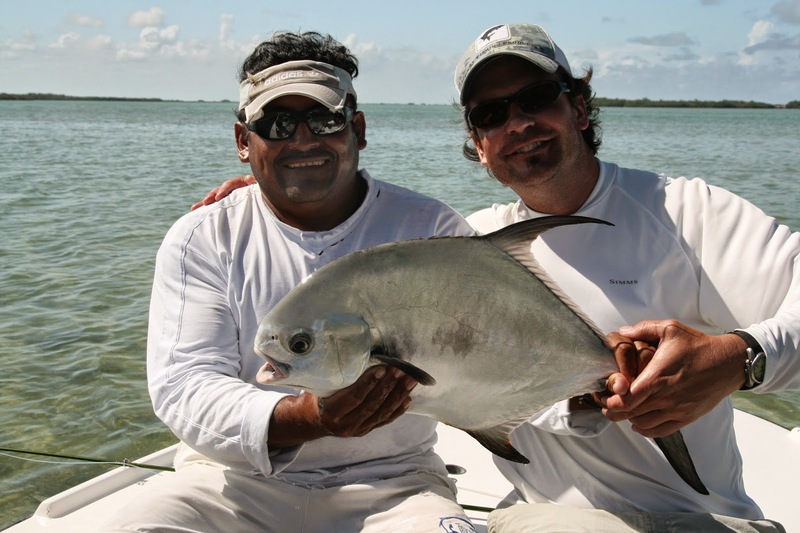 With my buddy Bimbo at the helm, I landed 7 permit in six days. That is the same number of permit that I had landed in the last 6 or 7 trips combined. I even landed 2 in one day - twice. On the last day, as if things couldn't get any better, we finally cracked the super grand slam. (That is landed bonefish, permit, tarpon and snook on a fly in the same day) Then we missed out on a second super slam when 2 more baby tarpon threw the hook before I could get them in . What a week! to this size - and others on either side. 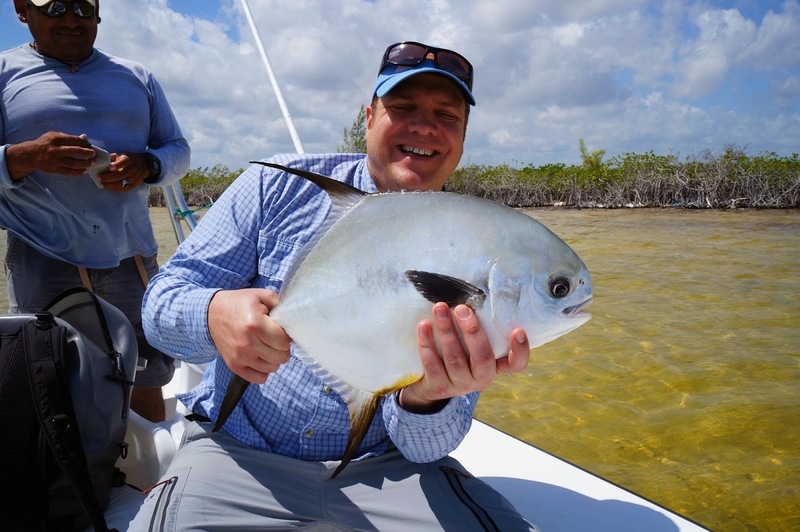 What made it even more satisfying is that only one was caught from a school of permit (usually "easier" fish), and all of the others were singles or doubles - and usually in very skinny water, all far far from the skiff . 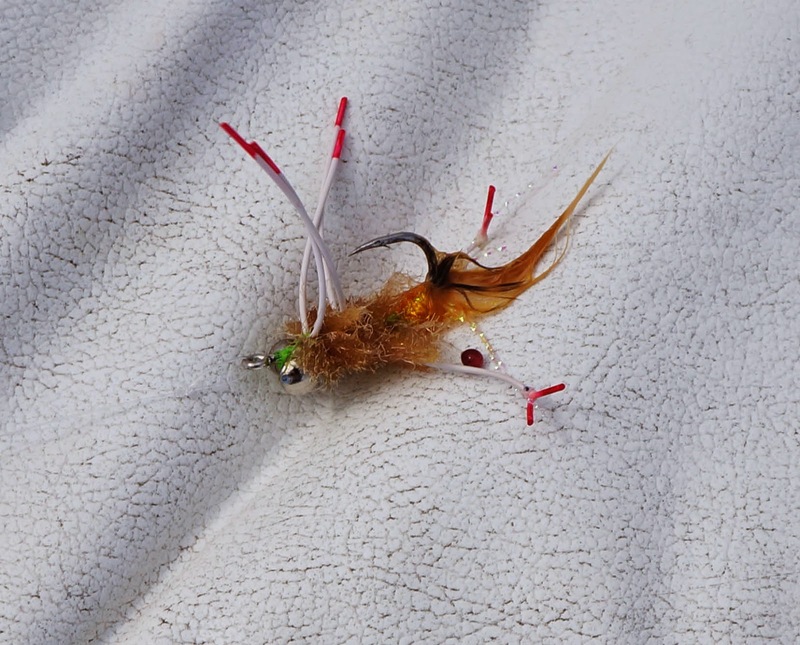 I caught 2 on "Boca Paila Crabs" one on a Puglisi Spawning Shrimp, and the last 4 on a fly that Jon Uhlenhop from the shop had tied for me years ago pictured below. Up until this point, Bimbo had said that it would never work, so it sat neglected. To Bimbo's credit - he told me to give it a whirl on this trip on day 5, and it resulted in 5 eats and 4 fish! This is what remained after the first 2 fell to his creation. What was different on this trip? We landed a total of 10 permit in 6 days. First of all - we were at the right place at the right time. It's important to remember that. What else? Not the weather - it ranged from perfect, to howling windy to downright cloudy/rainy on a few of the days, pretty much like all trips. Apart from incredible luck and finding happy fish, I can only point out 2 or 3 things that really made a noticeable difference. First of all - I switched to Seaguar Grand Max Fluorocarbon tippet material. This stuff is as good as it gets! I know it sounds like a minor thing - but it's a HUGE thing. Two trips ago I lost 3 or 4 permit on hook sets because of crappy or possibly old fluorocarbon that I was using. You don't get a permit to eat that often - and I will never use anything else again. It is also incredibly thin - and knots very well! When you have confidence in your hook set - it ALL works better! The second thing I did differently is that I used a 9 weight instead of my usual 8 wts. Not that the permit were too big for an 8 wt - it's just that I could cast a big crab a lot further and more accurately at greater distances than I ever have using the 9wt. I would guess that one switch gave me 10 or 15 feet of additional effective range. The last thing I did differently is that I finally took the time to figure out the right lines for each rod I fished at the beginning of the week and made changes rather than "deal with" less than perfect pairings. We talk about it at the shop all of the time - you have to match up the rod in each situation with the right fly line. For this kind of fishing - the Rio Tropical Bonefish Line and the SA Bruce Chard Grand Slam Line matched what I needed for my Sage Ones. Other lines worked for other rods. I must point out that these lines suited my casting style and my needs - another caster might prefer completely other lines. YOU have to figure out which lines work for you. The right line can be a game changer for every rod - period. I have been frustrated on other trips using the wrong lines on the right rods (and vice-verse) too many times. So was it the best trip ever? For Jerry? A great one - but there were so many to choose from - that I doubt it. I know he had a great time, and always enjoys time well spent. Isn't that most important thing? For me? Every time I take a trip with friends and there is fishing involved - it's the best! Throw in an obscene number of landed permit and this one might have been!